In your home, normal day to day activities will not set off your alarm. Alarms are set to go off when something big happens, like a window breaking or a door opening. In a normal, functioning alarm system, wind blowing a leaf onto a window or rain on your porch door won’t set the alarm off. Likewise, in your body, putting on a shirt, light touch from someone, or even a slight bump into the corner of a wall, should not cause you pain, ie set off your alarm. Like the alarm system, your nerves have a set sensitivity to stimulus. Light touch stimulates one type of nerve while stepping on a sharp Lego stimulates another type of nerve. The degree of the pressure or prick from a sharp object is what determines the signal to your brain and whether you experience the pressure of a sock hitting a carpet or the stabbing of your foot landing on a Lego. Experiencing pain can sensitize your nervous system. If you have a sensor going bad in your home OR the processor that interprets the signal is going bad, your alarm system can become so sensitive that when wind or a leaf blows by, it sets off the alarm. Your nerves work the same way, so you can become sensitive to little things such as cold temperature and stress. We can all agree that this isn’t normal, so lets look at the different “sensors” in your body. TEMPERATURE: This group is called Thermoreceptors. Typically, the warmer the water under your hand, the more the nerve is stimulated. Likewise, the colder it is, the less the nerve fires and you perceive the water to be cold. This travels up slow (C-fibers) nerves through your spinalthalamic tract (remember that from last week? If not here is the link: Week One) Normally, when the temperature is too hot, you will feel it warm up and when the nerve is stimulated enough to make your brain realize it could burn you, you will simply know to turn the water down because its too hot. Occasionally, you may touch water that is way too hot. That may overly stimulate your nerve so your body reacts along faster nerves (A-Delta) and you retract your hand from the water before you are actually able to perceive the heat. STRESS: When confronted with stress, a part of your brain called the amygdala, can stimulate your hypothalamus which, in turn, can stimulate your adrenal glands. These glands pump the chemical epinephrine (adrenaline) through your bloodstream which causes increases in heart rate, blood pressure, and respiratory rate. MOVEMENT: There are sensors, called mechanoreceptors, in your body that are sensitive to movement. These sensors activate when your joints and muscles are contracting and relaxing. HOW NERVES CAN BECOME MORE SENSITIVE AND HOW THAT CONTRIBUTES TO PAIN. Chronic pain is typically defined as pain lasting longer than 12 weeks. Pain that has lasted for six months, six years, whether it is intermittent or had been constant, is chronic pain. What happens to your body when you are in chronic pain? Somethings we do know, our mechanoreceptors can turn into nocioceptors. That means that receptors that normally signaled movement, not signal pain to the body. That is a physiological response, but if that is all that happens, why doesn’t treating the tissue work or why does emotional stress increase your back pain? “Pain itself often modifies the way the central nervous system works, so that a patient actually becomes more sensitive and gets more pain with less provocation. It’s called “central sensitization” because it involves changes in the central nervous system (CNS) in particular — the brain and the spinal cord. Sensitized patients are not only more sensitive to things that should hurt, but sometimes to ordinary touch and pressure as well. Their pain also “echoes,” fading more slowly than in other people.” This is a direct quote from Clifford Woolf, but it couldn’t be written any better. The bottom line is when you don’t understand why certain treatments, like massage, have worked…it is most likely due to central sensitization! I like to use the metaphor of a round-about. We discussed normal nervous responses above, but with chronic pain, something happens in the nervous system to make your body experience pain when it shouldn’t. 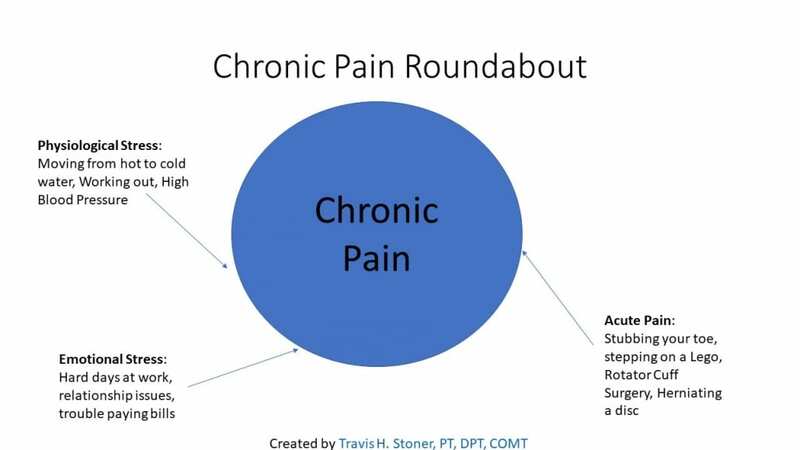 Think of Chronic pain like the center of the round-about. 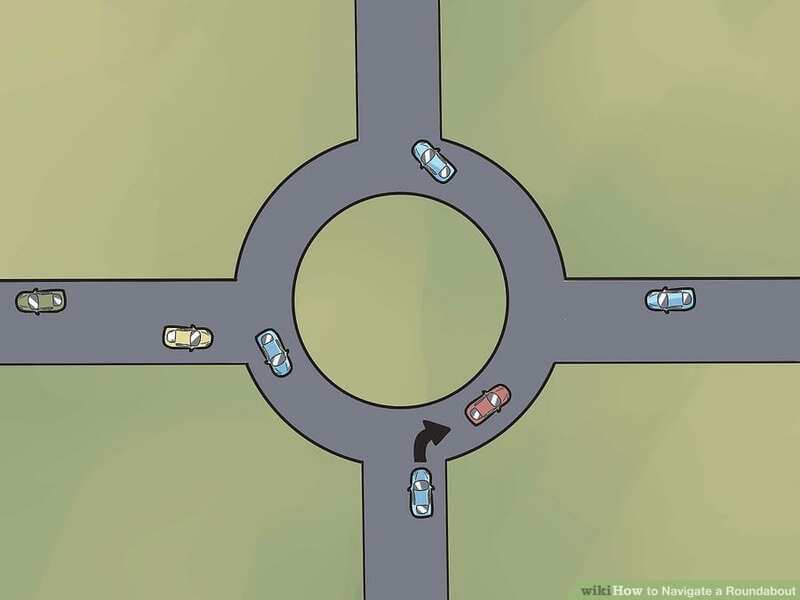 There are multiple entrances to the round-about: emotional stress like bad days at work, acute injury like twisting your ankle, physiological stress like entering a hot shower…these can all lead you into the chronic pain cycle. We don’t understand why some people develop central sensitization, but we are aware that it exists. When you think of the idea that normal stimulus can lead to increased pain, you can start to understand why those who know how to treat chronic pain do not use the “no pain, no gain” mentality. Digging into tissue that is already inflamed causes stress to the tissue. In non-sensitized people, this may be beneficial, but in someone with central sensitization, this will only make things worse. The only way to treat a patient with chronic pain is to treat the central nervous system…change the processing of the input because the input isn’t the problem. So how is it treated? Stay tuned to find out!